Description Size 10cm x 6cm (4" x 2.5"). good cond, chipped on edges, advertising text with a little staining on reverse, slight crease. 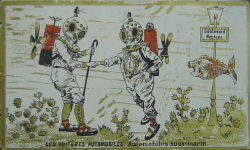 Les voitures automobiles, automobiles sous-marin.